THE only thing consistent about our weather is its inconsistency, yet this lull in winter conditions conjures up a distinct feeling of déjà vu. 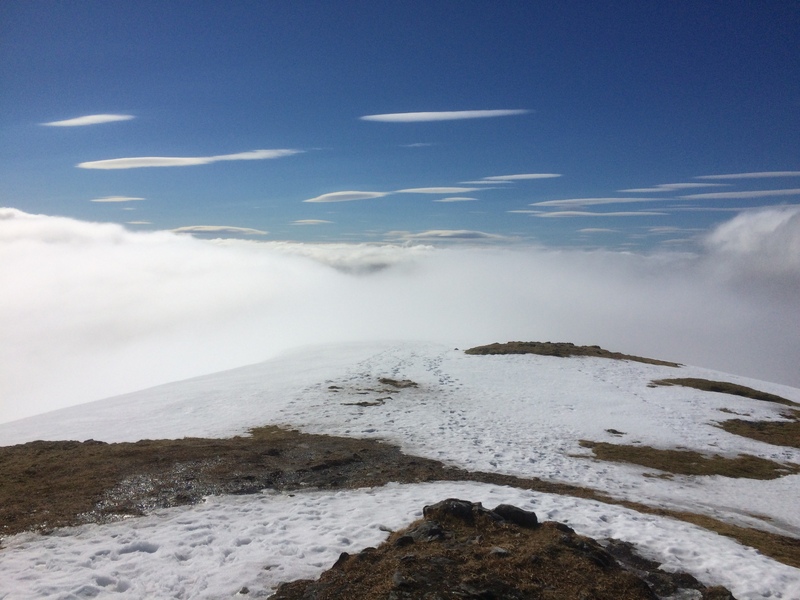 Last Sunday, March 13, I was out in the Monadhliath mountains, and suddenly it felt as though much of the winter gear I was carrying had become somewhat redundant, a burden it was time to shed. 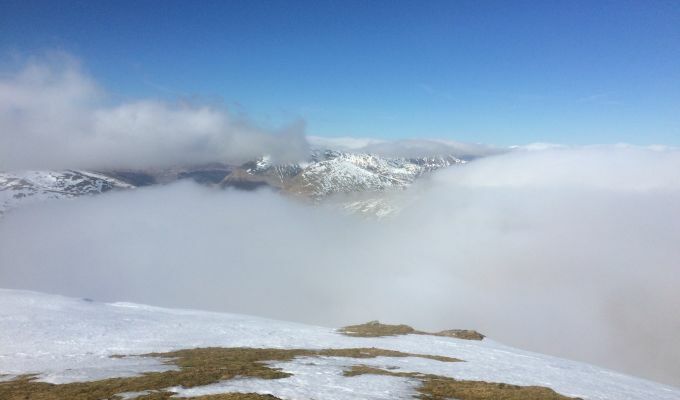 Exactly one year ago to the day, I was ascending Ben More at Crianlarich, my first walk of the year in lighter clothing. It felt as though spring had arrived; blue skies, bright sunshine and milder temperatures. Much of the snow had shrunk away and that which remained had no need of crampons. Yet winter wasn’t quite finished with us yet, and April saw a return of conditions that would have made January feel jealous. High in the Cairngorms we were back to Arctic conditions. It was this suspicion of a meteorological ambush that kept me wandering round the high tops above Newtonmore with full winter pack and heavy trousers that made my legs feel as if they were on fire. 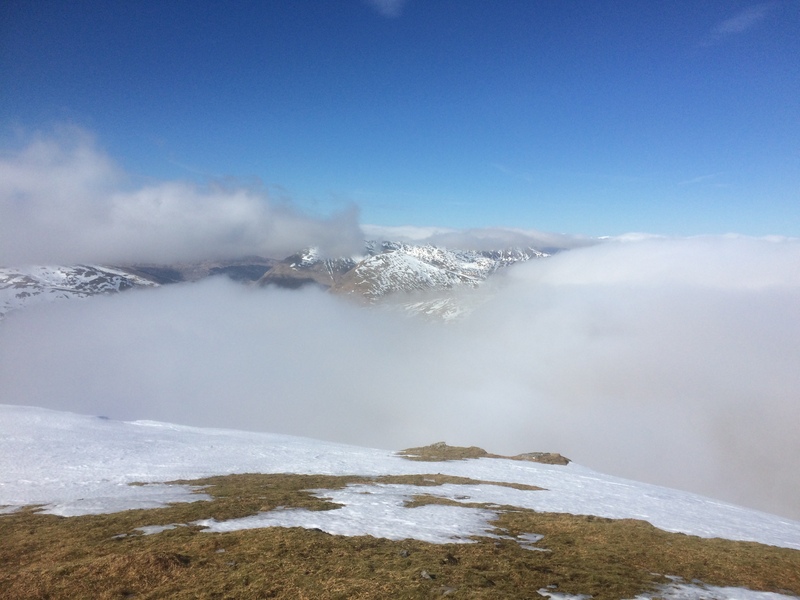 So when I set off up Ben Challum two days later with the promise of sunshine and clear skies, I put on the sunscreen and pared back the clothing. At first it felt good, a true liberation. Then, about halfway up, banks of cloud started rolling across en masse, obscuring the mountain and bringing a biting chill to proceedings. Suddenly, the lighter approach seemed to be a mistake. They were the wrong trousers, Gromit. I stopped and put on my waterproof trousers as an added layer, the big jacket came back out and balaclava, hat and gloves all made an appearance. I was back in full winter mode. The higher I climbed, the more the gloom intensified. I needed my ice axe on the snow-covered curving ridge round from the South Top to the main summit which had become indistinguishable from the skyline. I reached the huge cairn and took shelter from the wind. I was prepared to accept that any summit views would have to exist only in the imagination. And then it changed. The cloud being driven by the wind started dispersing, gradually at first, but the resistance quickly grew weaker. Suddenly, there was a glimpse of other peaks, their snow-streaked flanks peeking out from swirling banks of white. Blue sky filled in above me, and the sun finally made the breakthrough. Now there was clarity above 3000 feet and occasional, teasing glimpses of the world beneath. It only lasted a few minutes but this fleeting break in the cloud had rescued the day. I could go home happy now. That meant descending into the gloom again, but the momentum was unstoppable and about 30 minutes further down, it felt like springtime again. Yet there was no consistency, no pattern in the clarity. Cruach Ardrain stood clear, yet some of the peaks further down the Loch Lomond road were cloud-capped, some weren’t; Stob Binnein was there one minute, gone another, but Ben More’s summit remained hidden; the Bridge of Orchy Corbetts were clear but their higher neighbours took turns putting in an appearance. It was a real pick and mix selection. There’s something satisfying about days like this, views arriving when you least expect. They feel much more dramatic. When we first started walking the hills, we always prayed for full visibility. We soon got bored of that. Having a full view for the whole walk seemed predictable, unexciting. Much better to witness a slow reveal as the walk wore on. I still find these days the most gratifying. If only there was a solution to the trousers dilemma.